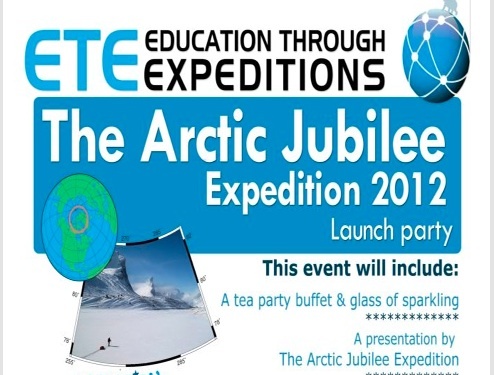 An intriguing expedition Antony Jinman is soon leading is the Arctic Jubilee Tea Party. 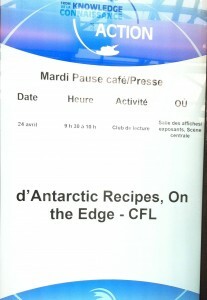 He is a British Polar Explorer, Public Speaker and the director of Education Through Expeditions and we met at the International Polar Year Conference in Montreal on Tuesday at our book club talk. 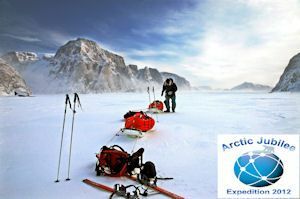 For the Diamond Jubilee in June, Antony is traveling with two young Canadians and six adventurers from Plymouth in June to the highest point on the Queen Elizabeth Islands in Canadian Arctic. It’s a fundraiser too for families in Plymouth dealing with loss. 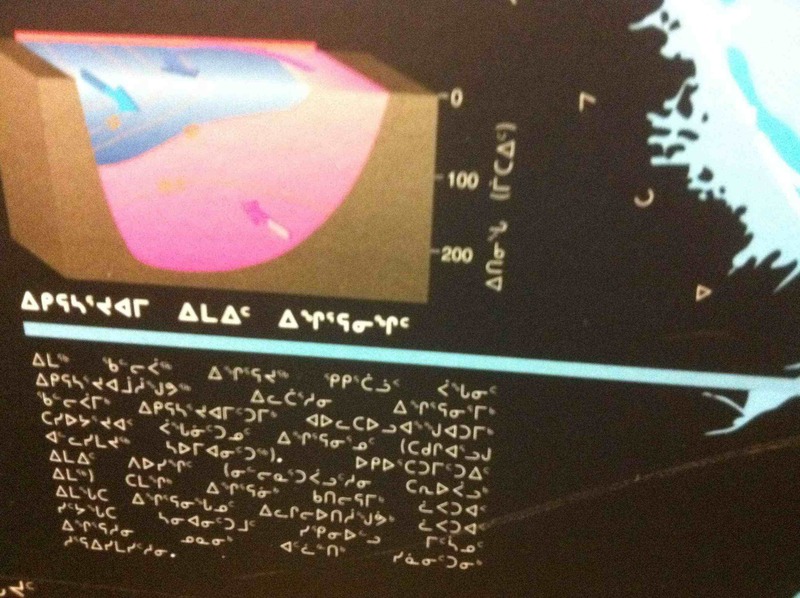 Antony suggested that Wendy, a former cook for treeplanters in Canada’s north and for volunteers and scientists in the Antarctic, might have suggestions of what to have at the tea party, besides cake: something British, something local. Wendy said cucumber sandwiches would suit but wouldn’t travel well. She proposed scones with currants. 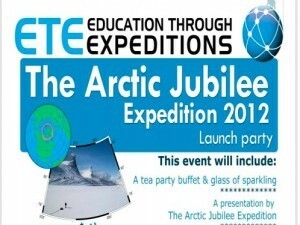 The Arctic tea party with cake or scones will be a feat, but as we commiserated, (almost) anything is possible. Very cool idea for an alternative meaningful and collaborative Diamond Jubilee (Queen Elizabeth’s 60 years on the throne celebration, if you don’t know). 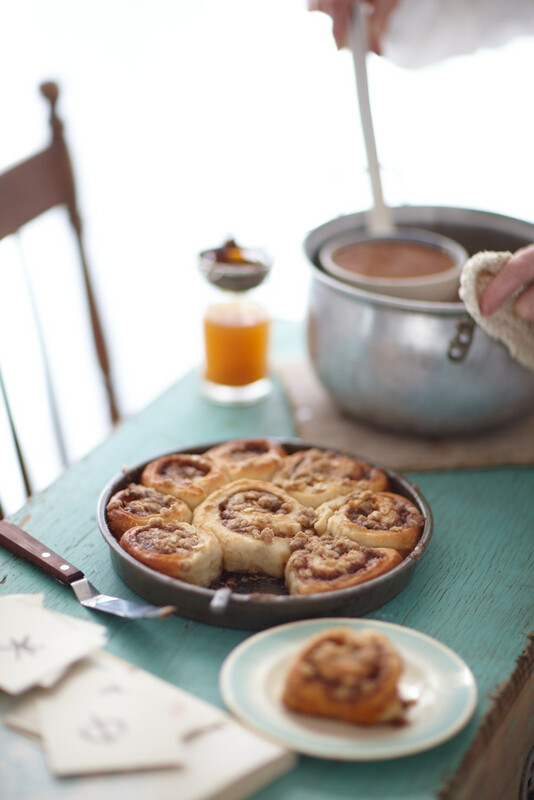 What does Polar science and cinnamon buns have in common? Wendy boarded the train at Cobourg with 140 cinnamon buns she made to take to the International Polar Year (IPY) Conference in Montreal. This week the IPY is hosting over 2000 delegates-Arctic and Antarctic scientists, policymakers, Inuit leaders such as Duane Smith of the International Circumpolar Council, astronaut and concerned global citizen Julie Payette, Arctic Council chair Swedish diplomat Gustaf Lind who apparently loves to tweet, academics, government representatives, companies like a Norwegian Arctic shipping company, Alaska’s Cold Climate Housing Research Centre and more. 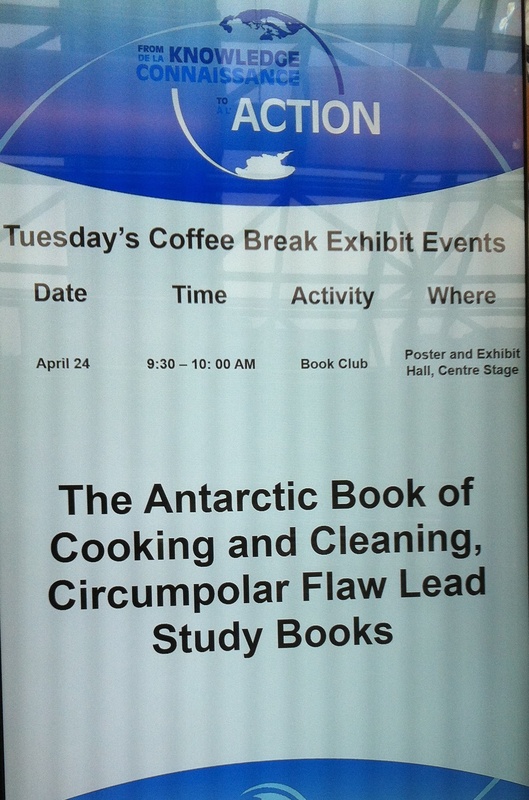 We were invited to the IPY to do a book talk session on The Antarctic Book of Cooking and Cleaning, our forthcoming food and cultural history book based on our 1995-6 environmental expedition. Something that sounds like a good housekeeping manual, Wendy said, does indeed have something to do with Polar science and policy. “Good spring cleaning practices could inform environmental policy,” she suggested. We shared how we also did that on our joint project by bringing volunteers to work with the Russian Antarctic Expedition, picking up abandoned nails, one at a time. “If you think about it, when you have to tackle large tasks, set a goal and chip away at it, maybe starting in the basement,” Wendy said. Food on King George Island transcended language and politics and brought people together, including the Russian cook who taught her his bread recipe through mime. 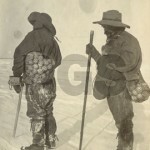 I showed a photo from 1901 from the Scott Discovery Expedition of scientists carrying penguin eggs (Royal Geographical Society), three of which remarkably returned to England. 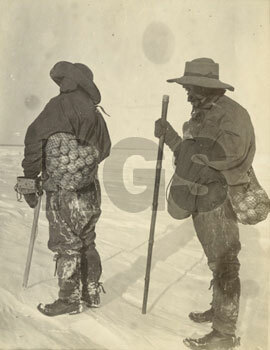 Penguin eggs, besides being coveted and cared for for their research potential, were eaten too by early explorers, including on the British Graham Land Expedition from 1934-1937. The eggs Wendy had shipped to Bellingshausen were from Argentinean chickens. She made delicious chocolate chip cookies and more. 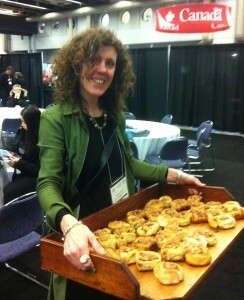 Over the announcements in huge Palais de Congrès was a call to hear polar authors and have a homemade brioche à la canelle. They were gone fast. One delegate, John Callas, from NASA who does satellite imaging of Antarctica and more, came directly to us having heard word. 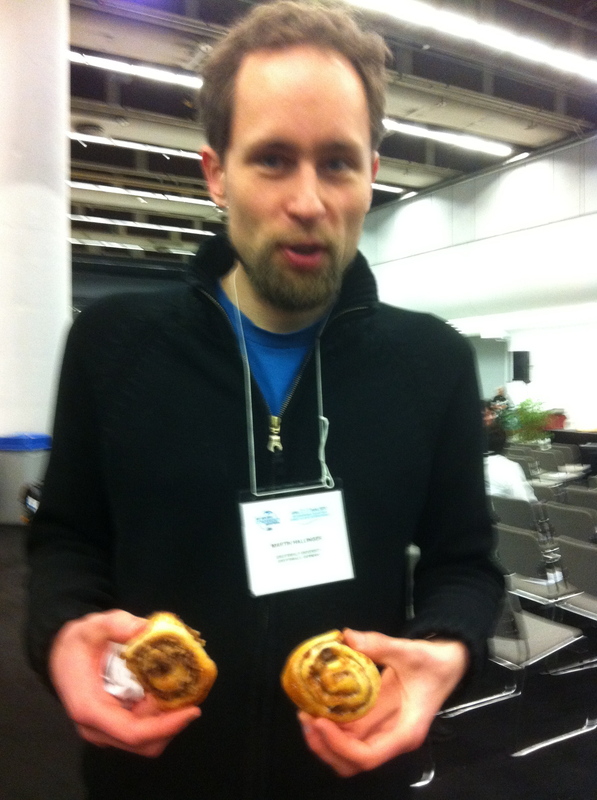 Jeremy Kirouac from the IPY said our presentation was amazing and funny and then ate the last brioche. Stories and examples of food and its critical importance on expeditions (and to the world) resonated with delegates as did the idea of telling others’ stories as a way of learning and information exchange, reflecting, acting and even nourishing. Breakfast: At the hotel breakfast buffet, Martin Hallinger, a young scientist from Germany gave me tips for using the industrial toaster and shared with us that during his three weeks with a German science expedition on the Noatak River, Bering Strait in Alaska, they brought too many starches to eat. The best part of the day was a small spoonful of peanut butter. A fear of bringing meat was attracting bears. 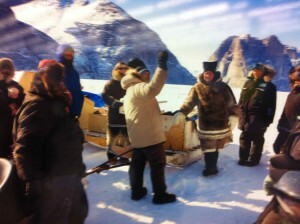 Still, they had a moose charge past their tents one night, chased by a bear, shaking the ground. Martin studies Arctic shrubs and their ecosystems. He had one of the conference buns and said Wendy’s buns are superior. He had never heard of my second favourite German explorer, Georg Forster. Anthony also said he enjoyed our storytelling and that he got interested in exploration because growing up in Plymouth he heard stories of Antarctic explorer Robert Falcon Scott who also hailed from Plymouth. “Food is critical. It can also be a fun healthy diet. I had my birthday on the ice, skiing across Ellesmere island. 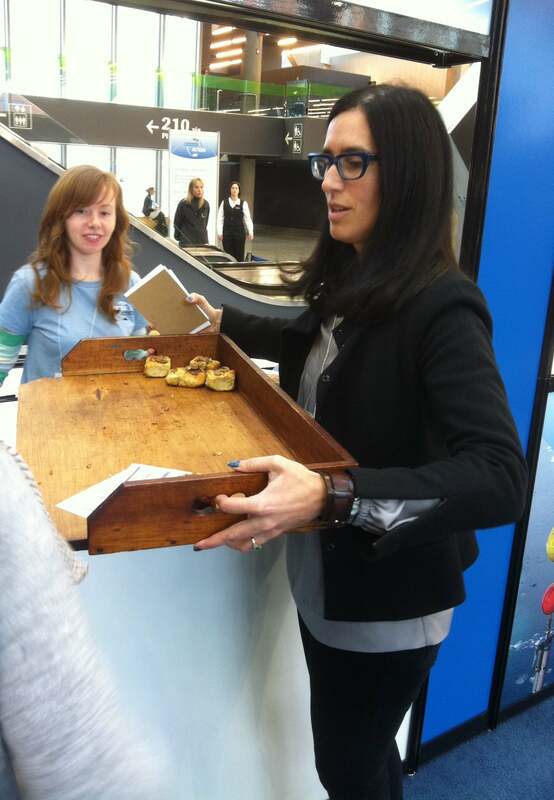 The surprise for me was waking up to tinned oysters,” Anthony told us. Narwhal tastes like horse chestnuts. You can eat it raw. Hunters use the ulu to scrape off the meat. It is grey, white and black striped like a zebra. Cut it in cubes and boil it in water. Cooked properly, its texture is like squid-it tastes like really good calamari. Use thin slices. Place in a roasting pan and add water until it comes half way up, add onions and salt. “The meat gets more tender the longer you cook it. It is leaner than beef,” Louisa said. The Siku-Inuit-Hila Research team takes a break from sea ice travel to listen to Joelie Sanguya, a hunter from Clyde River, Nunavut, as he points out local placenames and topography. Sam Ford Fjord. 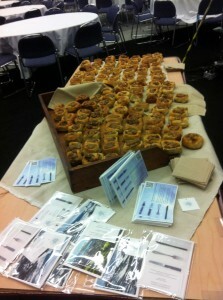 One of broad conference themes was of cooperation. Wendy went to session of scientists and practitioners discussing Citizen Science, including “Zooniverse: Web-Based Citizen Science”. She noted the similarity of what they were encouraging or endorsing (bridging science with citizens) with what our project tried to achieve–but in the inverse. For example they discussed how to bring Polar science to the public and to Bellingshausen we took civilians to the scientists. The objective was the same–collaborate cross-disciplinary for a common cause: care for the world, learn, contribute, care for one another. Before sundown Wendy and I went on the Amundsen, a Canadian icebreaker with 17 science labs and who knows how many kitchens. 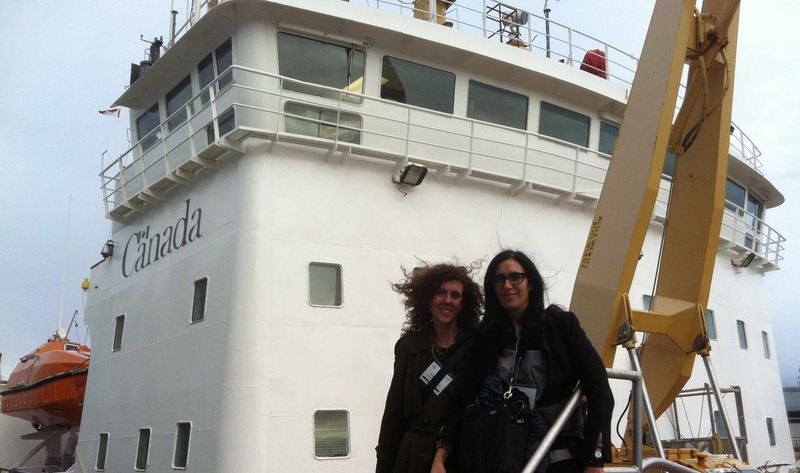 We reminisced about walking down narrow icebreaker hallways and the circularity of life. The conference was wonderful, educational, worrying and affirming because the people we met involved were thinking, frank, active and great. With climate change happening at a rate unexpected, I expected more indignation. After a notable dinner in Old Montreal at Bacata we went to the beautiful Cinéma Impérial theatre for part of Polar Film festival. The film Turf War in No Man’s Land, Suvi Andrea Helminen | Denmark | 2009 | 70 min | Danish, Russian, English with English sub-titles was a unique and incredible view on geopolitics and wonder at unseen places. The film tell of an expedition that is a mix of research, joint Swedish-Danish-Russian cooperation and underground pole flag-planting by Russia and Denmark’s underground mapping for their stake of pole. 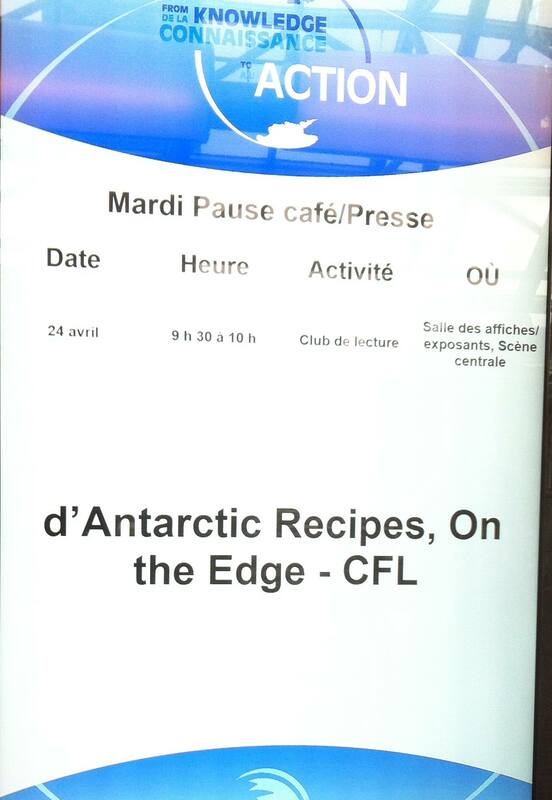 On Apr 24th, the Canadian Broadcast Commission reported muffling of Canadian public paid scientists at the conference. This is not on if so–academic and scientific freedom are necessary so we can continue to learn the impact of humans on the poles and beyond and what good humans are actually doing and pursuing. Cooperation, take steps, a few people can do good things were good messages. The conference appeared more Arctic-centred than Antarctic but we’re in a polar country and there is much to learn from the Arctic, across the poles and in between. It’s been a whirlwind polar 24 hours. Back to the book. ps South of 65 outside of Canada or Greenland we do not imagine anyone cooking species like Narwhal. We are not promoting or condemning cooking it but are reporting what people eat near the magnetic poles, now and historically. We encourage sustainable eating and are aware specific edible species are on concern and endangered lists.